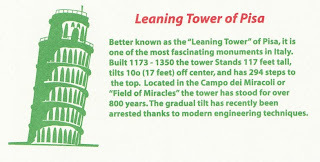 What caught my attention is the description of the Leaning Tower of Pisa...better know, according to the place mat, as the "Leaning Tower" of Pisa. The qualifying quotes made all the difference. 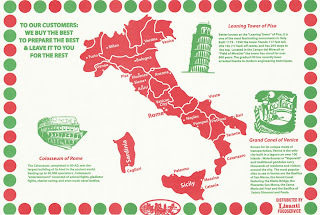 Much thanks to Brad Klypchak, better known as "Brad Klypchak," for pointing this out to me.